Over 17,000 previously unreleased premium 833 toll free numbers are becoming available! In 2018, the Federal Communications Commission (FCC) approved the order for Somos, the Toll-Free Numbering Administrator, to conduct a single round, sealed bid Vickery auction for the 17,000+ premium Toll-Free numbers set aside in the 833 opening period in 2017. NumberBarn will be offering registration and bidding for these numbers. As of January 15, 2019, we are still waiting for further details about the auction date and time. The 17,000+ 833 numbers available are the most desired premium numbers that were originally pre-registered by multiple parties during the 833 opening period in 2017. The FCC decided the best course of action for distribution was a sealed bid auction. 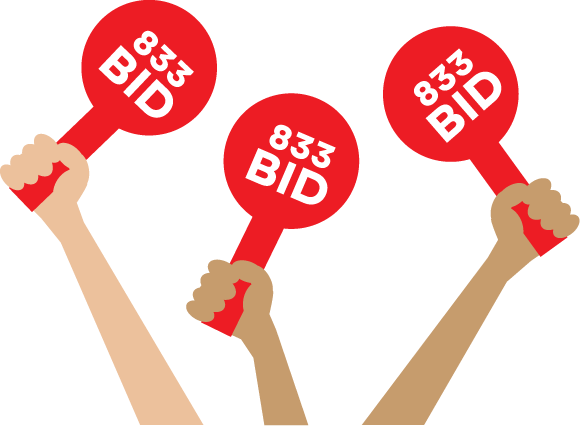 These numbers can be found in our search and will show the auction only message. Registration, bidding, dates, and further information will all be available here as the auction and details are finalized by the FCC & Somos. Please check back here for updated information. As of January 15, 2019, we are still waiting for further details about the auction date and time.